Download "GENERAL REGULATIONS CONCERNING BACHELOR AND MASTER OF SCIENCE DEGREES"
1 Board 7/2013, Doc4 Revised Attachment 1 GENERAL REGULATIONS CONCERNING BACHELOR AND MASTER OF SCIENCE DEGREES 1. Overview of Degree Structures, Compulsory Studies and Duration The biotechnology study programme consists of a Bachelor s degree in biotechnology and a Master s degree in one of the curriculum s majors or specialisms. Moreover, IBT offers the Master s Degree Programme in Bioinformatics. Studies consist of systematically advancing study modules, and the extent of the courses to be taken is measured in ECTS credits awarded. The first conferrable academic degree in this study programme is the Bachelor of Science (BSc), for which a total of 180 ECTS credits must be earned. The course structure is organised in such a way that full-time students can complete the degree programme in three academic years. The degree requirements are successfully completed basic and intermediate studies and a set of core courses and free-choice studies. The intermediate studies module includes the Bachelor s thesis and a maturity test. The Master of Science (MSc) is a graduate degree that comprises 120 ECTS credits. The course structure is organised in such a way that full-time students can complete the degree programme in two academic years. 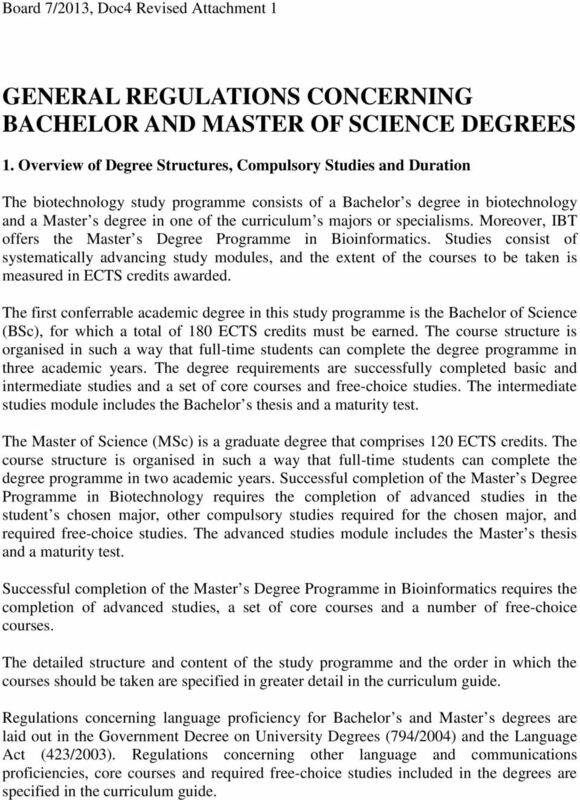 Successful completion of the Master s Degree Programme in Biotechnology requires the completion of advanced studies in the student s chosen major, other compulsory studies required for the chosen major, and required free-choice studies. 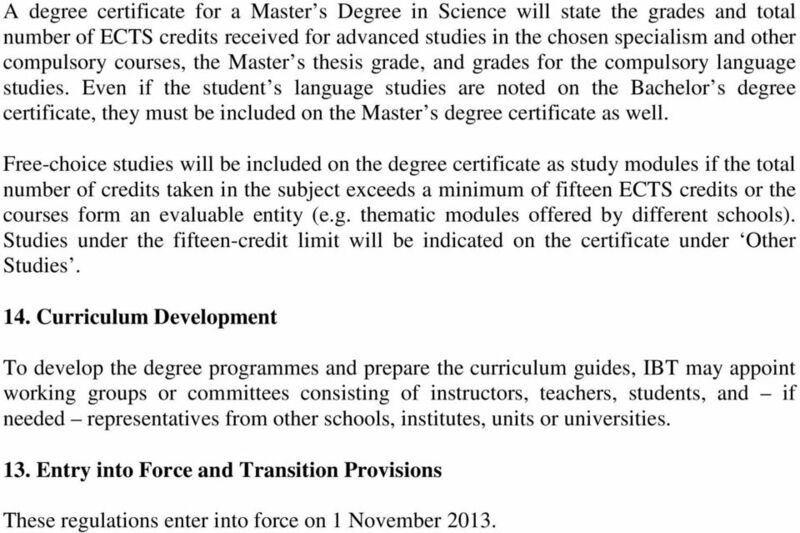 The advanced studies module includes the Master s thesis and a maturity test. Successful completion of the Master s Degree Programme in Bioinformatics requires the completion of advanced studies, a set of core courses and a number of free-choice courses. The detailed structure and content of the study programme and the order in which the courses should be taken are specified in greater detail in the curriculum guide. Regulations concerning language proficiency for Bachelor s and Master s degrees are laid out in the Government Decree on University Degrees (794/2004) and the Language Act (423/2003). 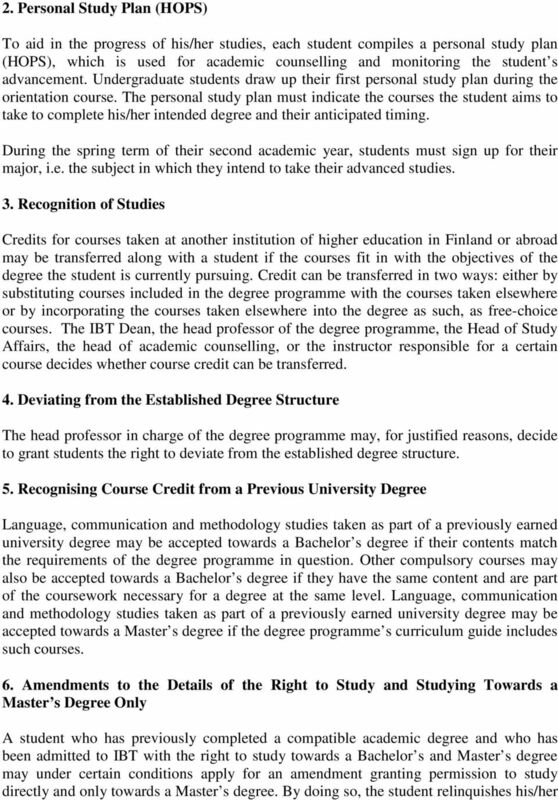 Regulations concerning other language and communications proficiencies, core courses and required free-choice studies included in the degrees are specified in the curriculum guide. 3 right to take the Bachelor s degree. The change in the details of the student s right to study may require the completion of additional courses. 7. Expiration of Studies Completed study modules (e.g. basic, intermediate and advanced study modules), courses and maturity tests do not generally expire, and they count towards the degree to their original extent. If the curriculum guide has changed substantially since the student was first admitted, the student and his/her instructor must agree on how any unfinished modules can be completed. 8. Priority Order If there are more students enrolled for a course, exercise, tutorial or group session than there are seats available, priority is given to students for whom the course is compulsory. Students who are taking the course in accordance with the timing recommended in their curriculum guide have second-highest priority. 9. Registration of Credits Once successfully completed, course credit(s) are recorded in the studies register as specified in the University s Regulations on the Assessment of Studies. Also registered in the studies register are credits transferred from previously completed courses or other courses included in the degree on separate grounds. The average grades for completed study modules are recorded in the studies register as well. 10. Grading Grading follows the criteria and grading scale specified in the University s Regulations on the Assessment of Studies. The grading scale is either pass/fail or, for passed and numerically graded courses, between 1 and 5 (1=sufficient, 2=satisfactory, 3=good, 4=very good and 5=excellent). Accepted Bachelor s and Master s theses are also graded on a scale of 1 5. Further information on grading can be found in the curriculum guide. 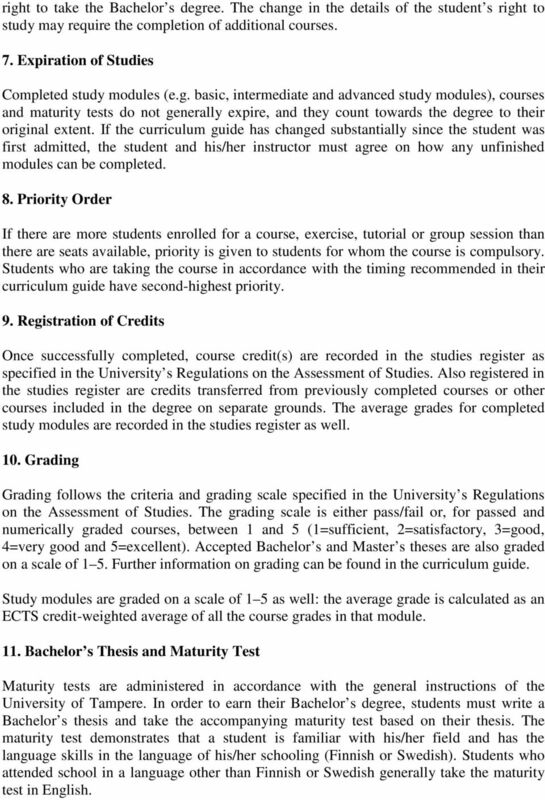 Study modules are graded on a scale of 1 5 as well: the average grade is calculated as an ECTS credit-weighted average of all the course grades in that module. 11. Bachelor s Thesis and Maturity Test Maturity tests are administered in accordance with the general instructions of the University of Tampere. In order to earn their Bachelor s degree, students must write a Bachelor s thesis and take the accompanying maturity test based on their thesis. The maturity test demonstrates that a student is familiar with his/her field and has the language skills in the language of his/her schooling (Finnish or Swedish). Students who attended school in a language other than Finnish or Swedish generally take the maturity test in English. 5 information on research objectives, data and methodology used, and key research findings. Instructions on writing a Master s thesis are available from the IBT Study Affairs office and website, or from the thesis supervisor. The student must sign up for the maturity test when submitting the thesis for evaluation. At least two examiners appointed by the Dean must give their report on the thesis. The examiners must submit their reports within three weeks from the date the student took the maturity test, unless the Dean grants an extension. The examiners reports are submitted to the student at least four days before the thesis is awarded a grade. Should the student wish to respond to the reports, he/she must do so within four days after receiving them. If the student does not submit a response, the Dean will award a grade for the thesis. 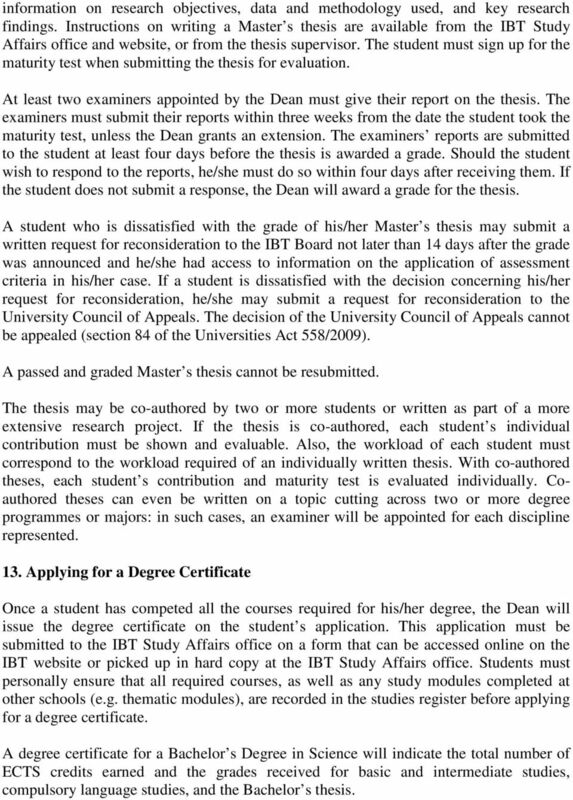 A student who is dissatisfied with the grade of his/her Master s thesis may submit a written request for reconsideration to the IBT Board not later than 14 days after the grade was announced and he/she had access to information on the application of assessment criteria in his/her case. If a student is dissatisfied with the decision concerning his/her request for reconsideration, he/she may submit a request for reconsideration to the University Council of Appeals. The decision of the University Council of Appeals cannot be appealed (section 84 of the Universities Act 558/2009). A passed and graded Master s thesis cannot be resubmitted. The thesis may be co-authored by two or more students or written as part of a more extensive research project. If the thesis is co-authored, each student s individual contribution must be shown and evaluable. Also, the workload of each student must correspond to the workload required of an individually written thesis. With co-authored theses, each student s contribution and maturity test is evaluated individually. Coauthored theses can even be written on a topic cutting across two or more degree programmes or majors: in such cases, an examiner will be appointed for each discipline represented. 13. Applying for a Degree Certificate Once a student has competed all the courses required for his/her degree, the Dean will issue the degree certificate on the student s application. This application must be submitted to the IBT Study Affairs office on a form that can be accessed online on the IBT website or picked up in hard copy at the IBT Study Affairs office. Students must personally ensure that all required courses, as well as any study modules completed at other schools (e.g. thematic modules), are recorded in the studies register before applying for a degree certificate. A degree certificate for a Bachelor s Degree in Science will indicate the total number of ECTS credits earned and the grades received for basic and intermediate studies, compulsory language studies, and the Bachelor s thesis. 6 A degree certificate for a Master s Degree in Science will state the grades and total number of ECTS credits received for advanced studies in the chosen specialism and other compulsory courses, the Master s thesis grade, and grades for the compulsory language studies. Even if the student s language studies are noted on the Bachelor s degree certificate, they must be included on the Master s degree certificate as well. Free-choice studies will be included on the degree certificate as study modules if the total number of credits taken in the subject exceeds a minimum of fifteen ECTS credits or the courses form an evaluable entity (e.g. thematic modules offered by different schools). Studies under the fifteen-credit limit will be indicated on the certificate under Other Studies. 14. Curriculum Development To develop the degree programmes and prepare the curriculum guides, IBT may appoint working groups or committees consisting of instructors, teachers, students, and if needed representatives from other schools, institutes, units or universities. 13. Entry into Force and Transition Provisions These regulations enter into force on 1 November 2013. 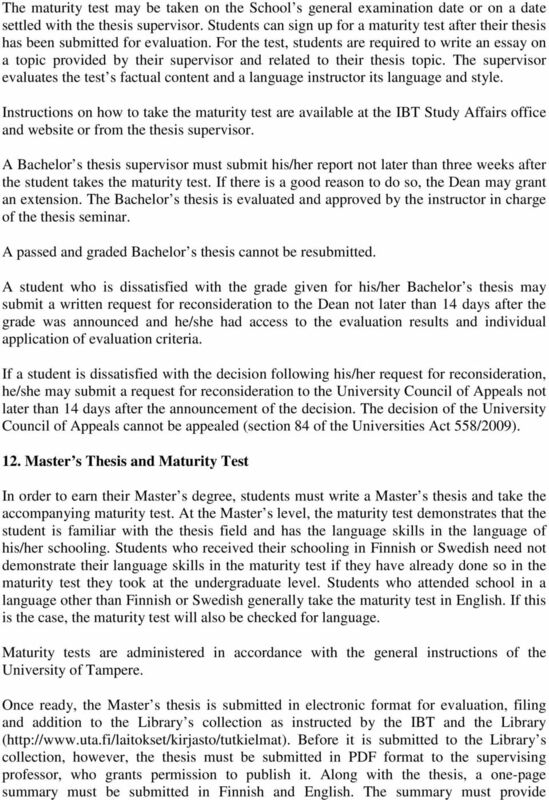 Under section 14 of the Universities Act (558/2009), the Board of the University of Tampere hereby approves these regulations on 22 February 2012.